Directly, so that learners can start directly with the MemoTraining after they have begun their course. Read more about it in 'MemoTrain directly at start of course'. After an activity is completed, you can make the questions in that activity available in the MemoTrainer. After an activity is completed, you can add extra questions to the MemoTrainer that were not visible in the activity. Read more about the MemoTrainer in: 'What is the MemoTrainer?'. Via the tab Templates Click on Edit next to the template you want to add the questions. When under the Blocks & Activities tab , click on Edit next to an activity. 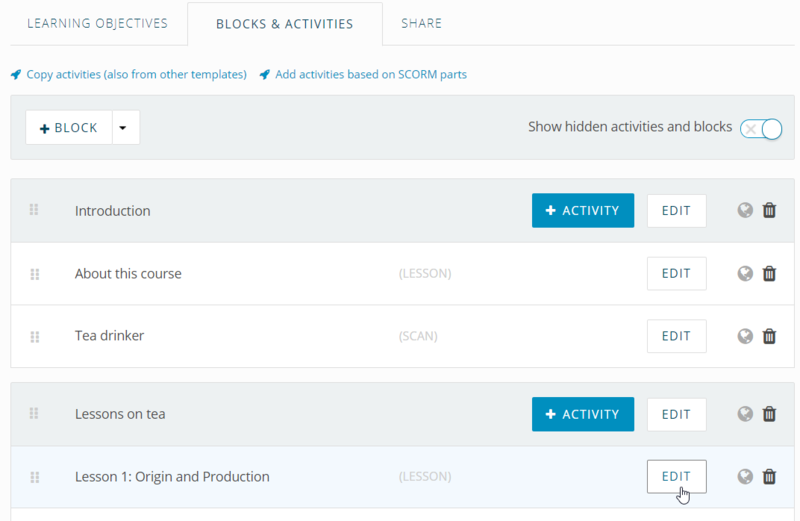 Next, select the option 'Make questions MemoTrainable when lesson is finished' under the Properties tab. Via the tab 'Extra MemoTrainable Questions' you can add extra questions that come available after the activity is finished. The learners will then daily receive questions that they have not seen before, which will make it more interesting for them.